The NFL is not the only place that people are kneeling in protest but this next bit of information is sure to make you angry. Anti-American sentiment is spreading all across the country and what one man did at the Tomb of the Unknown Soldier is going too far. 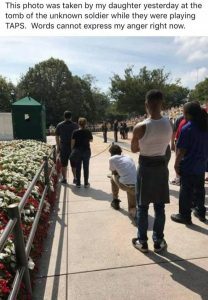 A picture has recently gone viral due to a man kneeling during a ceremony at the Tomb of the Unknown Soldier at Arlington National Cemetery. The man was seen on his knees during the playing of taps. “I support everyone’s right to free speech, but I feel in the shadow of the Tomb of the Unknown Soldier it is inappropriate,” Zachary Bell tweeted. Has professional sports protest’s bled onto hallowed ground? Arlington National Cemetery had long been a place of reflection, honor, and remembrance.